New mural project making progress. Day 1 of our install. Written by Carson Ting. Posted on May 31, 2018. Filed under Drawings, Design, Blogging. Tagged chairman ting, mural, office art, perkins and will, turner construction. 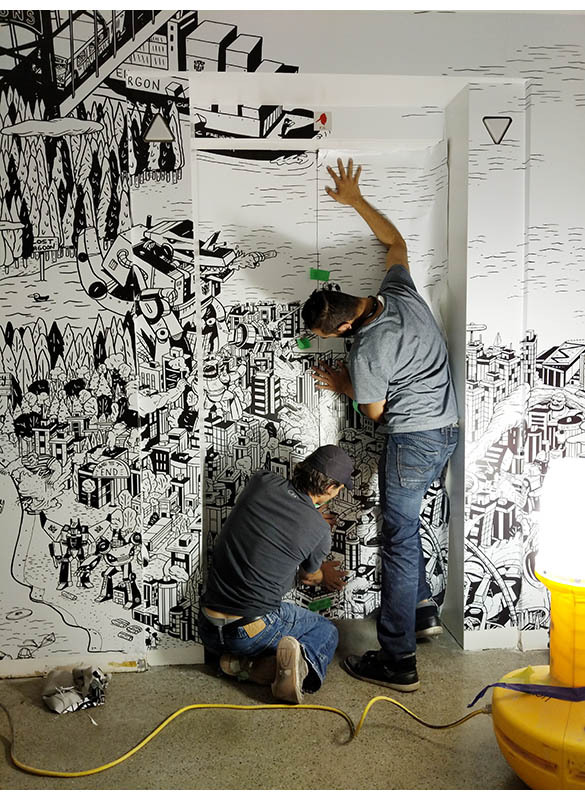 Comments Off on New mural project making progress. Day 1 of our install.. Sneak peek! 👀 We’re working on one of our biggest mural projects to date. Over 14,000 sq. ft. of fresh office space in downtown Vancouver, designed by the talented interior designers at Perkins + Will for a super cool client which we’ll disclose closer to launch date. Illustration and art by yours truly. Construction by Turner Construction, vinyl print and install by Frank at Northside Sign. 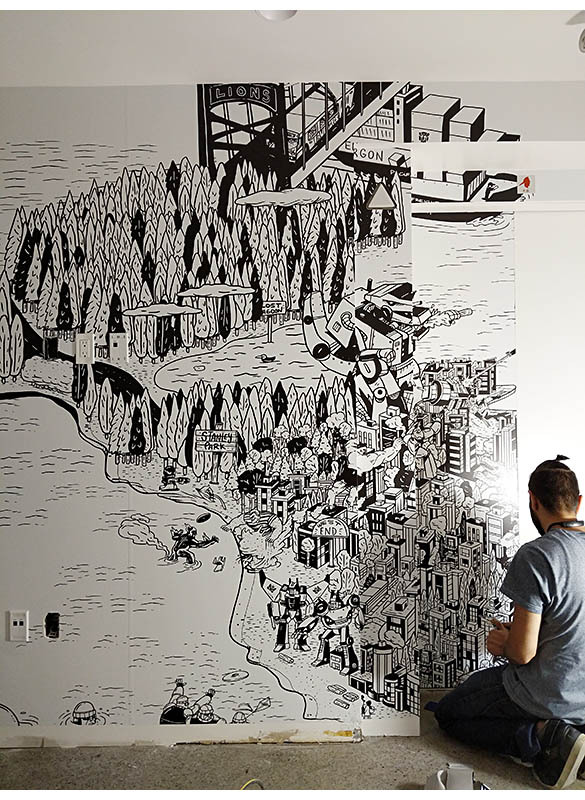 Powers Construction graffiti installation featured in the latest Gray Magazine issue. Written by Carson Ting. Posted on December 5, 2016. Filed under Design, Blogging. Tagged graffiti, gray magazine, installation. 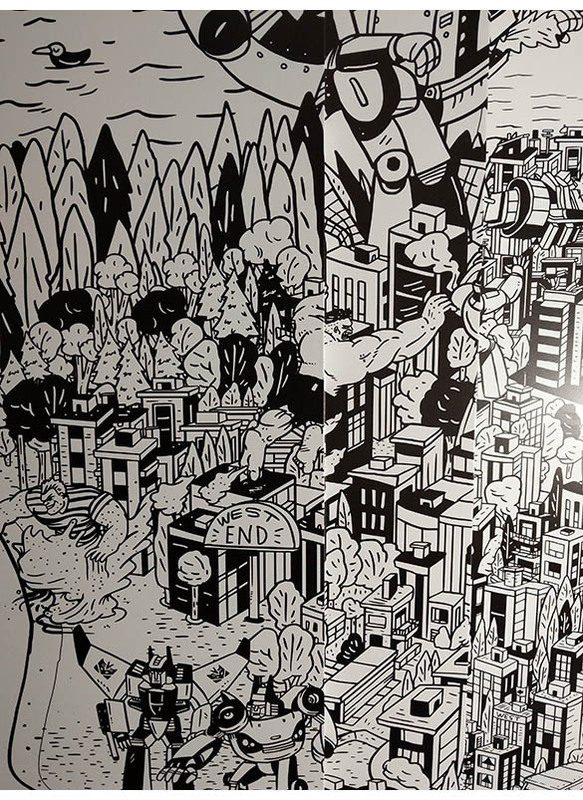 Comments Off on Powers Construction graffiti installation featured in the latest Gray Magazine issue..
We’re so stoked to see our graffiti installation featured in the latest Gray magazine (issue No. 31). This project came to us this past summer and it’s still one of our most favourite projects of the year. It was crazy fun working on this installation. Big thanks again to Kenji Rodríguez-Tanamachi for helping us. Written by Carson Ting. Posted on May 25, 2016. Filed under Design, Murals. Tagged design, eastvan, mural, powers construction. Comments Off on Bricks, a shipping container mural for Powers Construction. One of the most fun projects I’ve worked on this year so far. A commissioned piece on the side of a shipping container located right across from my studio at 1000 Parker in East Vancouver. This piece called ‘Bricks’ is for Powers Construction. Written by Carson Ting. Posted on June 22, 2015. Filed under Drawings, Design, Blogging. Tagged LA, adrien brody, first shot, hollywood, jameson whiskey, kevin spacey. Comments Off on Jameson Whiskey’s First Shot movie poster design and illustration. New movie poster design and illustration I did for Jameson Whiskey’s First Shot produced by Kevin Spacey and starring Adrien Brody, a Trigger Street Productions. The movie will premiere in Hollywood LA this Saturday June 26th. We fly down to LA this Friday from Vancouver, just a few days after we land from our 2 month stay in Toronto. We hope to see all these famous faces there this weekend. Written by Carson Ting. Posted on January 27, 2015. Filed under Drawings, Design. Tagged design, tin drum. Comments Off on New design work for Tin Drum Asia Cafe. Say hello to Votee. An app that gets instant opinions from the people that matter. Written by Carson Ting. Posted on November 5, 2014. Filed under Design, Animation. Tagged app design, video, votee. Comments Off on Say hello to Votee. An app that gets instant opinions from the people that matter..
Meet Votee, it’s a mobile app that let’s you get instant opinions from the people that matter in your life. It’s a fun and private way to have your friends vote on your dilemmas. This app has been two years in the making with a small group of passionate and talented friends. It’s now available through the Apple App Store and it’s free! We had a ton of fun working on this app, from the UI design, to the logo and even this video, we poured our hearts into it. For the making of this video, we want to give our big thanks to Chad Jones for the animation, Lori Russell for the voice over and GGRP for the sound design and audio. Click here to download your VOTEE app and start voting! Help us like the Votee facebook page and follow the app through Instagram and Twitter. Wrapping up the metal mural project. One panel at a time. Written by Carson Ting. Posted on April 28, 2014. Filed under Drawings, Design, Blogging. Tagged artwork, illustration, kgms mural, mural. Comments Off on Wrapping up the metal mural project. One panel at a time..
After 180+ hours of studio time and 25+ hours of prep work (Thanks Freshbooks! 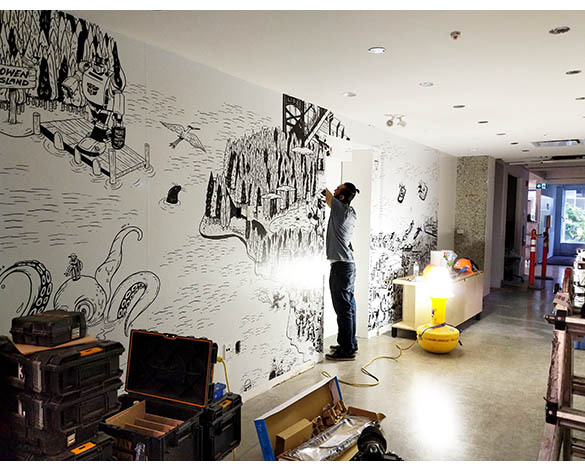 ), our KGMS large scale mural project with Henriquez Partners Architects is finally wrapping up. We’ve spent the past few days packaging all 15 panels up for final art delivery for Tuesday morning. We’ve got exactly 5 more panels to package up for tomorrow but we’re excited that it’s finally finished. This project was a bigger undertaking than we originally thought and have learned a ton from working with such large scale metal panels along with using enamel paints and in combination with KRINK markers and spray paint (KRINK and MOLOTOW markers apparently don’t work well on spray painted surfaces. Who knew!). We’ll be sure to post more photos up once it’s installed at the Kenneth Gordon Maplewood School location. We’re also very thankful to have had Albert Law document the whole project which we’ll post on this site soon.